So it’s Z’s 4th year on this earth and we were visiting my husbands family for the holidays. 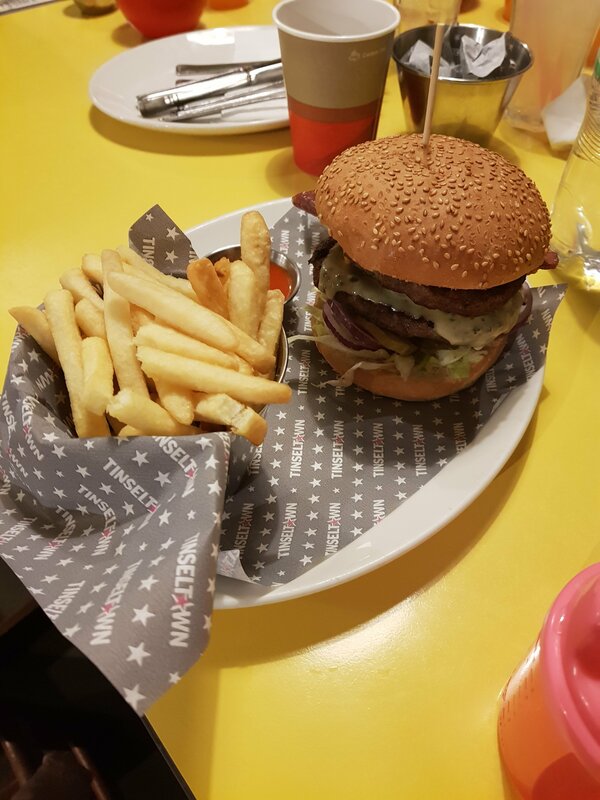 After a manic afternoon at soft play we took the vote of the kids to eat at Tinsletown in Gants Hill. 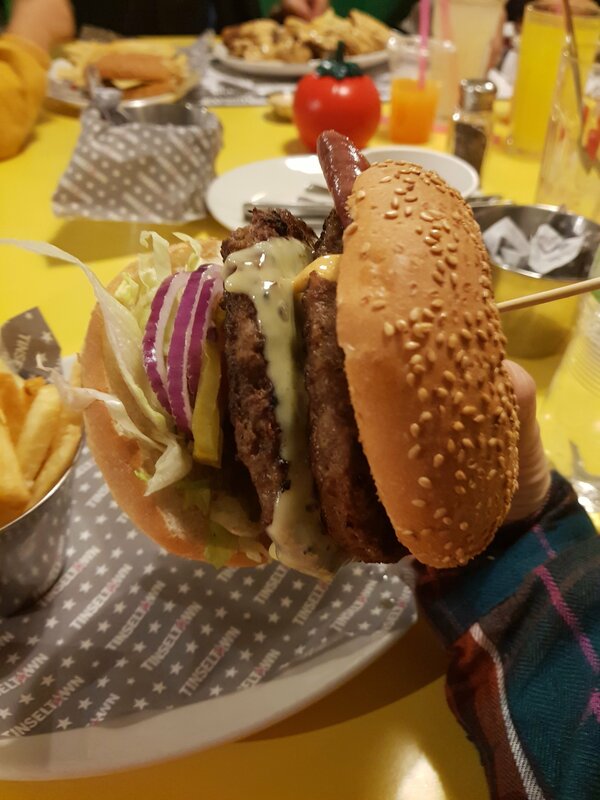 As you may know, Tinsletown is one of the original halal American burgers joints in London, way before the ‘gourmet burger’ craze we have seen in the past few years. I didn’t have high hopes as i have been disappointed in the past. But it was not my birthday today! In our party we had myself, husband, the two boys and baby M. Also joining us were my sister in law (SIL), brother in law (BIL), niece and nephew. We were given a booth and two high chairs. The waiter took our order – 4 cheeseburgers & chips from the children’s menu, wings in creamy cajun sauce for my SIL, empire state challenge burger for my husband and two double dons for myself and my BIL. The adults all have a choice of side and dip. The food came very quickly, kids meals first. Well proportioned burger, nice patty and cheese. The burgers however were totally on point. Its surprisingly difficult to find just a good old fashion cheeseburger, perfectly grilled, well seasoned, juicy, tasty patty, sesame seeded bun, slice of tomato and lettuce and onion. The fries were crispy and delicious but just not enough in the portion. They were presented in little metal bucket. Maybe good for aesthetics but didn’t deliver on value. The service went a bit sideways from here, after only having half the table cleared, we wanted a dessert. I had to get up to ask and the waitress and she just walked off as I was talking to her. So I approached the reception area. I requested for a birthday special and ordered a large sharing dessert. So the lady brought the dessert out as she was her trying to keep one birthday candle alight as 50 cent it’s your birthday came blaring out of the speakers. Baring in mind i have eaten at two other of the restaurants for birthdays, this was an anti-climax. To the restaurants credit they took the wings off the bill and offered a milkshake as a sorry. Over all, Tinsletown is back on the menu. When you have that classic, honest burger craving and want to give the brioche bun and goats milk cheese served on a metal tray a miss.